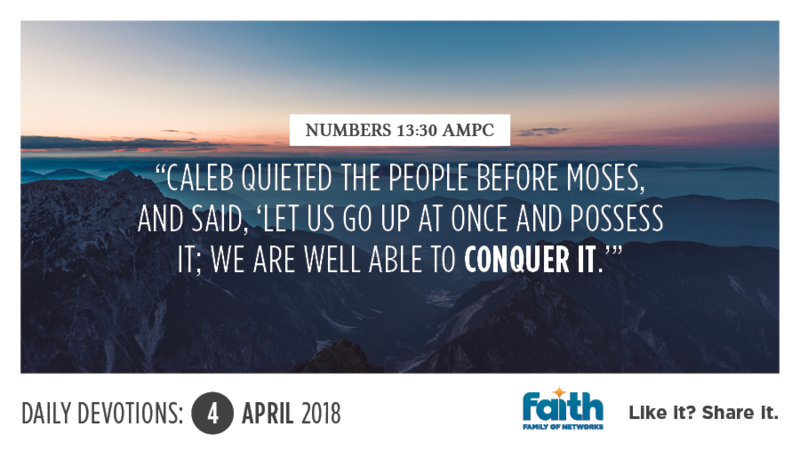 Since the Greek word used in Matthew 11:12, to describe how we advance the Kingdom of God, is the word "lambano", meaning "to take by force" or "to seize with a grip that cannot be shaken off", we can relate it to the account in Numbers chapter thirteen. Here, we read about the report given by the twelve spies Moses sent to scout out the promised land. While ten men complained and reported the impossibilities of the mission, Caleb and Joshua were extremely excited and eager to conquer the territory. They knew full well the promise God had given Moses concerning the promised land, and had no doubt that since He had promised it, God would make a way for them, no matter the impossibilities. Their faith fueled their expectation to see God's promise fulfilled in their midst. So, while the ten were murmuring and negatively influencing the people of Israel, Caleb quieted the people and urged them to change their focus. He wanted them to stop reasoning in the flesh and rather act upon their faith in God, by leaving at once He assured them that because they had God's Word on it, they were well able to conquer the land. Sadly, many Christians respond to challenges by natural reasoning too, which leads to fear, instead of faith in what God has promised. Today, take on those challenges that are threatening to steal your peace and joy, see them through eyes of faith, backed by the Word of God, and don't be moved by what you hear or see. Everything you need to walk in the fullness of life has been secured for you on the cross. Refuse to shrink back in fear, purse what He has promised by faith, and enter in to your promised land today.